I eat oatmeal pretty much every morning for breakfast. My favorite preparation is with diced apples, ground flax meal, unsweetened coconut and cinnamon. Sometimes I will add sliced almonds or a tablespoon of nut butter. Instead of the apples I might use raisins/craisins, bananas or blueberries. Rarely I add a sweetener. If I do it’s a drizzle of agave nectar. For the most part, though, I like the natural sweetness from the fruits. 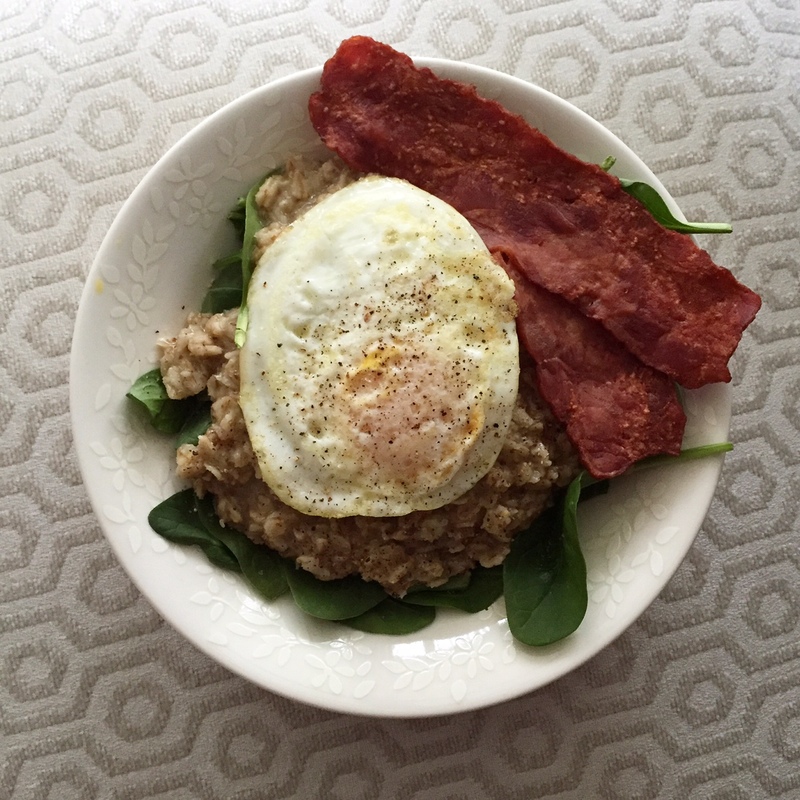 Since I eat oatmeal all the time and usually the same way, it got me thinking about trying a savory oatmeal. “Why not put and egg on it?” I never tried an over easy or fried egg on something and didn’t like it. Of course a burger was the first thing that came to mind. Love a fried egg on a burger. The next thing I thought of was how much I enjoyed them baked on pizza with arugula, extra virgin olive oil, prosciutto, and shaved Parmigiano cheese. So with this in mind I decided to try it out. I cooked the oatmeal and added in a tablespoon of flax meal (gotta get in my omega-3’s). 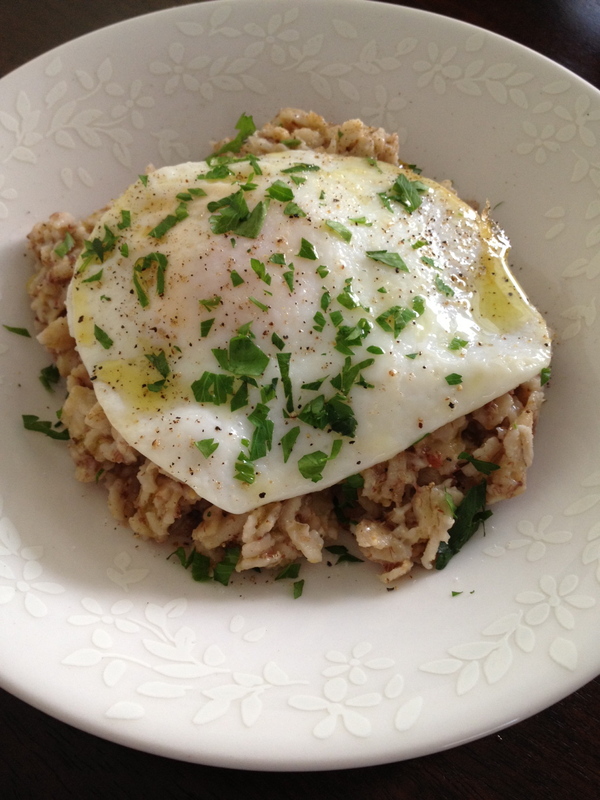 Then cooked an egg over easy in extra virgin olive and placed it over the oatmeal. Whatever olive oil was left in the pan I drizzled on top. Finally, I sprinkled on some sea salt, cracked fresh black pepper and chopped parsley. It was quite delicious! I loved how the runny yoke mixed with the oats and the olive oil. The next time I have it in the house, I will have to try adding shaved Parmigiano cheese. I think it would compliment this meal well. 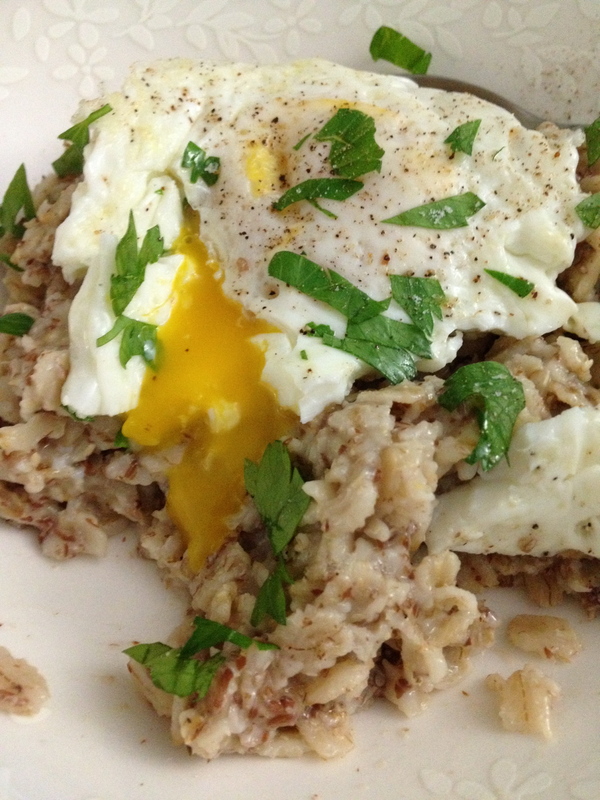 If you’re looking for a change from the standard sweet oatmeal, try savory and put an egg on it!